From aspiration to reality, our team of award winning experts will help you grow your tax base, build economic wealth and prosperity for residents and businesses, and reinvent your community. The RMA team is leading the CRAFT BREWERY approach to Economic Development. Does your city have areas with vacant storefronts & corridors? Over 300 new restaurants, shops and offices opened their doors from our Business Attraction Plans and Efforts. Is your city thriving or just getting by? We’ve helped cities attract over $1 billion in new residential and commercial development based on our Economic Development Activities and Plans. Did development pass you by during the last real estate cycle? The New Zoning codes we drafted helped our cities substantially build their tax base and attract private investment. Are people aware of your city’s brand? Do you even have a brand? Our creative marketing team develops brands that turn client cities around. Is someone actively managing your city’s economic growth? We’ve negotiated over a dozen Public-Private Development agreements that were built in our downtown cities. When it’s time to improve, call RMA. We’ve helped countless municipal leaders transform their problem areas into assets. Find out how we can help you. 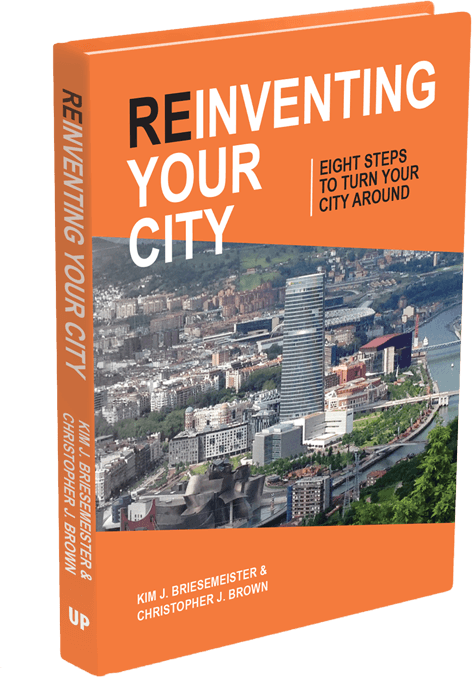 Reinventing Your City is an essential guide for every city leader striving to make their community a better place. Copyright ©2019 RMA. All Rights Reserved. Powered by Realtime.